Azure AD join allows you to join devices directly to Azure AD without the need to join to on-premises Active Directory while keeping your users productive and secure. Azure AD join is enterprise-ready for both at-scale and scoped deployments. This article provides you with the information you need to plan your Azure AD join implementation. While Hybrid Azure AD join may be preferred for certain scenarios, Azure AD join enables you to transition towards a cloud-first model with Windows. If you are planning to modernize your devices management and reduce device-related IT costs, Azure AD join provides a great foundation towards achieving those objectives. You are adopting Microsoft 365 as the productivity suite for your users. You want to manage devices with a cloud device management solution. You want to simplify device provisioning for geographically distributed users. You plan to modernize your application infrastructure. Azure AD join works with both, managed and federated environments. A managed environment can be deployed either through Password Hash Sync or Pass Through Authentication with Seamless Single Sign On. These scenarios don't require you to configure a federation server for authentication. WS-Fed: This protocol is required to join a device to Azure AD. WS-Trust: This protocol is required to sign in to an Azure AD joined device. If your identity provider does not support these protocols, Azure AD join does not work natively. Beginning with Windows 10 1809, your users can sign in to an Azure AD joined device with a SAML-based identity provider through web sign-in on Windows 10. Currently, web sign-in is a preview-only feature. You can't use smartcards or certificate-based authentication to join devices to Azure AD. However, smartcards can be used to sign in to Azure AD joined devices if you have AD FS configured. Recommendation: Implement Windows Hello for Business for strong, password-less authentication to Windows 10 devices. On-premises Active Directory, you need to synchronize them to Azure AD using Azure AD Connect. Azure AD, no additional setup is required. On-premises UPNs that are different from Azure AD UPNs are not supported on Azure AD joined devices. If your users use an on-premises UPN, you should plan to switch to using their primary UPN in Azure AD. Is only applicable to Windows 10 devices. Is not applicable to previous versions of Windows or other operating systems. If you have Windows 7/8.1 devices, you must upgrade to Windows 10 to deploy Azure AD join. Is not supported on devices with TPM in FIPS mode. Recommendation: Always use the latest Windows 10 release to take advantage of updated features. Device management for Azure AD joined devices is based on an MDM platform such as Intune) and MDM CSPs. Windows 10 has a built-in MDM agent that works with all compatible MDM solutions. MDM-only - A device is exclusively managed by an MDM provider like Intune. All policies are delivered as part of the MDM enrollment process. For Azure AD Premium or EMS customers, MDM enrollment is an automated step that is part of an Azure AD join. Co-management - A device is managed by an MDM provider and SCCM. In this approach, the SCCM agent is installed on an MDM-managed device to administer certain aspects. Because Azure AD joined devices are not connected to on-premises Active Directory, group policies are not supported. If you are using group policies, evaluate your MDM policy parity by using the MDM Migration Analysis Tool (MMAT). Are the unsupported policies necessary for Azure AD joined devices or users? Are the unsupported policies applicable in a cloud driven deployment? If your MDM solution is not available through the Azure AD app gallery, you can add it following the process outlined in Azure Active Directory integration with MDM. Through co-management, you can use SCCM to manage certain aspects of your devices while policies are delivered through your MDM platform. Microsoft Intune enables co-management with SCCM. For more information, see Co-management for Windows 10 devices. If you use an MDM product other than Intune, please check with your MDM provider on applicable co-management scenarios. Recommendation: Consider MDM only management for Azure AD joined devices. We recommend migrating applications from on-premises to cloud for a better user experience and access control. However, Azure AD joined devices can seamlessly provide access to both, on-premises and cloud applications. For more information, see How SSO to on-premises resources works on Azure AD joined devices. The following sections list considerations for different types of applications and resources. If an application is added to Azure AD app gallery, users get SSO through Azure AD joined devices. No additional configuration is required. Users get SSO on both, Microsoft Edge and Chrome browsers. For Chrome, you need to deploy the Windows 10 Accounts extension. Rely on Web Account Manager (WAM) for token requests also get SSO on Azure AD joined devices. Don't rely on WAM may prompt users for authentication. Provide a no-prompt SSO experience to users. If you use AD FS, see Verify and manage single sign-on with AD FS. Recommendation: Consider hosting in the cloud (for example, Azure) and integrating with Azure AD for a better experience. Users get SSO from Azure AD joined devices if the device has access to a domain controller. Recommendation: Deploy Azure AD App proxy to enable secure access for these applications. Your users have SSO from Azure AD joined devices when a device has access to an on-premises domain controller. For printers, you need to deploy hybrid cloud print for discovering printers on Azure AD joined devices. While printers can't be automatically discovered in a cloud only environment, your users can also use the printers’ UNC path to directly add them. Azure AD joined devices don't support on-premises applications relying on machine authentication. Recommendation: Consider retiring these applications and moving to their modern alternatives. Self-service in OOBE/Settings - In the self-service mode, users go through the Azure AD join process either during Windows Out of Box Experience (OOBE) or from Windows Settings. For more information, see Join your work device to your organization's network. Windows Autopilot - Windows Autopilot enables pre-configuration of devices for a smoother experience in OOBE to perform an Azure AD join. For more information, see the Overview of Windows Autopilot. Bulk enrollment - Bulk enrollment enables an administrator driven Azure AD join by using a bulk provisioning tool to configure devices. For more information, see Bulk enrollment for Windows devices. Are your users tech savvy to go through the setup themselves? Self-service can work best for these users. Consider Windows Autopilot to enhance the user experience. Are your users remote or within corporate premises? Self-service or Autopilot work best for remote users for a hassle-free setup. Do you prefer a user driven or an admin-managed configuration? Bulk enrollment works better for admin driven deployment to set up devices before handing over to users. Do you purchase devices from 1-2 OEMS, or do you have a wide distribution of OEM devices? If purchasing from limited OEMs who also support Autopilot, you can benefit from tighter integration with Autopilot. The Azure portal allows you to control the deployment of Azure AD joined devices in your organization. To configure the related settings, on the Azure Active Directory page, select Devices > Device settings. Set this option to All or Selected based on the scope of your deployment and who you want to allow to setup an Azure AD joined device. Choose Selected and selects the users you want to add to the local administrators’ group on all Azure AD joined devices. Select “Yes if you require users to perform MFA while joining devices to Azure AD. For the users joining devices to Azure AD using MFA, the device itself becomes a 2nd factor. Before you can configure your mobility settings, you may have to add an MDM provider, first. 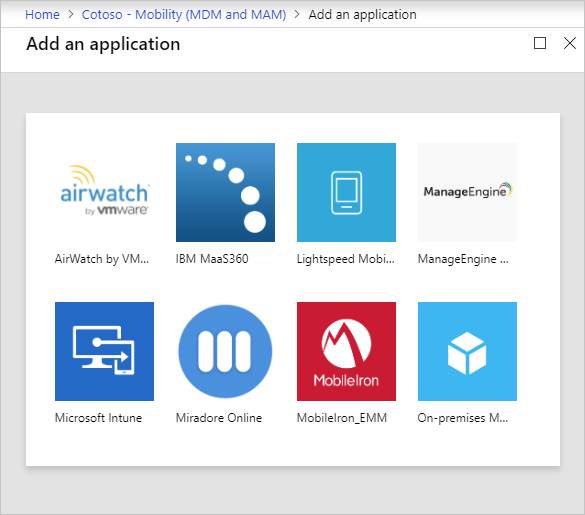 On the Azure Active Directory page, in the Manage section, click Mobility (MDM and MAM). Select your MDM provider from the list. Select your MDM provider to configure the related settings. Select Some or All based on the scope of your deployment. User is in MDM scope: If you have an Azure AD Premium subscription, MDM enrollment is automated along with Azure AD join. All scoped users must have an appropriate license for your MDM. If MDM enrollment fails in this scenario, Azure AD join will also be rolled back. User is not in MDM scope: If users are not in MDM scope, Azure AD join completes without any MDM enrollment. This results in an unmanaged device. Each URL has a predefined default value. If these fields are empty, please contact your MDM provider for more information. MAM does not apply to Azure AD join. If you want to enable state roaming to Azure AD so that users can sync their settings across devices, see Enable Enterprise State Roaming in Azure Active Directory. Recommendation: Enable this setting even for hybrid Azure AD joined devices. If you have an MDM provider configured for your Azure AD joined devices, the provider flags the device as compliant as soon as the device is under management. You can use this implementation to require managed devices for cloud app access with conditional access.